Today I have a NOTD for you! I love to have painted nails and after I have painted them baby blue last time, I wanted to paint my nails in a light grey color. Keep on reading to the results! I of course used my Sensationail Polish to Gel set. I mixed 8 drops of the polish to gel transformer with 6 drops of Rimmel's Super Gel in Bare Hug with 2 drops of Sally Hansen's Miracle Gel polish in Pinky Promise. This is how it turns out. Exactly what I wanted! Because I find Bare Hug to be a little bit too dark when it's dried up. And adding those two drop of Pinky Promise gives it a purple-ish hue in certain light, which I love! 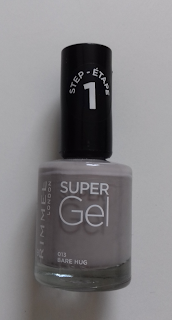 For those who were looking for a swatch of Rimmel London's Super Gel in Bare Hug, this is not exactly how it looks. Anyway, I think it's very wearable color, especially during the summer, because it looks like a fresh color. What nail color are you currently wearing?